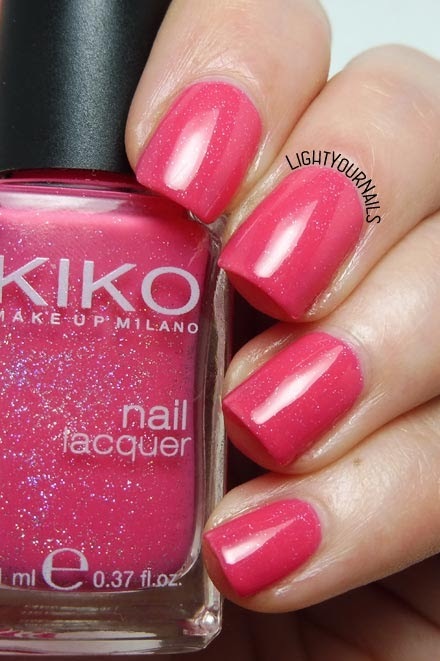 Kiko 504 Rosa Glassa Perlato | Light Your Nails! Here's to a new #ITPANTONE2018 shade, this is an ongoing challenge on Instagram. I hope you are following me there, too! PANTONE 17-1929: Rapture Rose. "Romantic and affectionate Rapture Rose is an artful rosey red that brings a flirtatious charm to the Spring 2018 palette." I picked Kiko 504 Rosa Glassa Perlato as my Rapture Rose shade. This is a bright pink filled with holographic microglitters that unfortunately you can only see in the bottle. Application is easy, the shade is really pretty but removal is a pain. Those glitters just don't want to get away. What can I say? I loved this Kiko nail polish range. The new ones aren't just as good in my opinion. What's your experience with Kiko?